Hotel Minerva is located in the town of Sorrento, attractive seaside resort, known and loved since ancient times as the Land of the Mermaids, a favourite destination for élite tourism, a must for those who love Italy and the Mediterranean, with its perfumes, its colours, and its warm hospitality. Coming from motorway A3 exit at Castellammare di Stabia and continue along the road following the directions for Penisola Sorrentina, continue on SS 145. Once you have arrived in Sorrento follow the one way street to the left, continue along Via degli Aranci and continue for about 2 km. From Naples central station, take the local train the Circumvesuviana to Sorrento,staying on the train until the end of the line.Then take the local orange bus line A that leaves from outside the station and stops in front our Hotel.You can also easly book our transfer service by private taxi, if you prefer. From the Tiburtina railway stationin Rome it is possible to get directly to Sorrento by taking coach service Marozzi coach service wich runs daily.Upon arriving in the centre of Sorrento,continue with the local orange bus A that stops outside our Hotel. Daily ferries or hydrofoils leave from the Port of Beverello in Naples to the Port of Sorrento.From Port Line D to the center and Line A from the center Piazza Tasso to the Hotel, our Hotel can be reached by taking the local orange bus from the Port line A or you can book our transfer service. Beginning the month of April the sea taxi offers daily routes to Sorrento. From the Airport of Capodichino in Naples Sorrento can be reached by taking the Curreri airport coach service which leaves from outside the airport terminal on a daily basis. The coach stops at the train station in Sorrento, where you can take the local orange bus line A that stops outside of our Hotel, or book our transfer service. 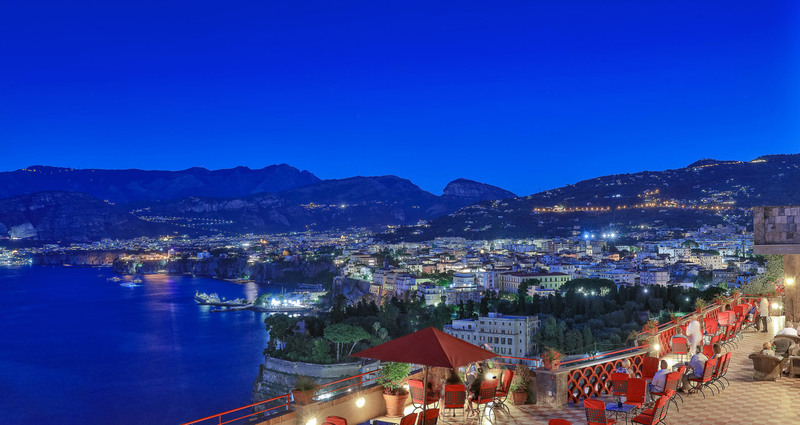 The Sorrento Peninsula, southern spur of the Gulf of Naples, is the ideal starting point to discover all the territory’s wealth: Capri and Ischia, the Amalfi Coast with its pearls Positano, Ravello and Amalfi, and the Vesuvian cities, such as Pompeii and Herculaneum, that guard their priceless treasures.